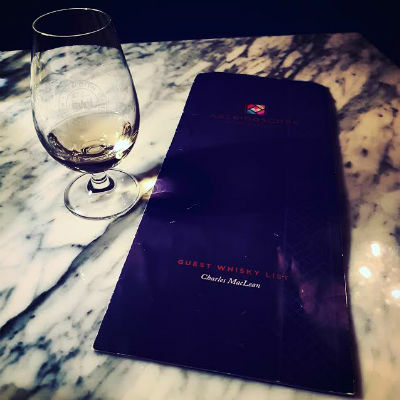 Following on from a £300,000 refurbishment of its Queen Street venue, The Scotch Malt Whisky Society has now launched a rather special whisky selection in its new Kaleidoscope Bar. 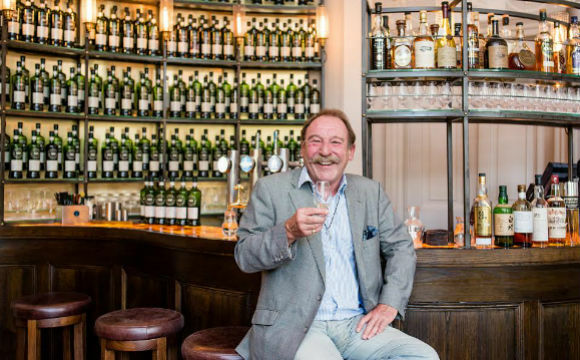 This is the first time non-SMWS whiskies have been available in any society venue, and who else would one ask to curate such a selection, than one Charles MacLean. Tiger: Afternoon Charlie, many thanks for taking the time to chat to me today as I know you’re a very busy man. Charles: No problem at all, good to see you again and have a proper catch up. Although you’re quite right, before Christmas I’ll be in China for ten days, then Ireland for a few days and then I have a couple of bits of business in Edinburgh before I finally call it quits for the year. T: Before we talk about the selection here in the Kaleidoscope Bar, can you briefly explain how you first got involved with SMWS? 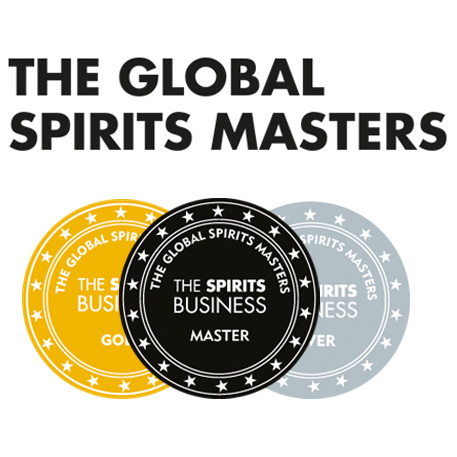 C: I joined in 1983 but I was a rather infrequent visitor to the society, until I did a course in the ‘evaluation of potable spirits’ at the Scotch Whisky Research Institute in 1992 with Richard Gordon (former MD of SMWS). He was looking for a sense of structure to the society’s tasting notes, and making them accurate and useful yet keeping them exotic and off the wall. It was then I was asked to be a Chair of the tasting panel and it’s something I continue to do to this day. Speaking of whisky, shall we get a dram? T: Moving towards the present day, where did the inspiration for your selection at the Kaleidoscope Bar come from? C: It was an idea Jan (Damen, current UK Operations Director at SMWS) had a while ago, you know, stocking non-SMWS whiskies. He wanted to make it a selection with a difference, quite different to a lot of other whisky bars. He phoned me and I narrowed the brief down and thought, why don’t we get a lot of old discontinued stuff that people generally can’t get their hands on? T: So you joined almost every other whisky collector and started trawling through whisky auction sites online? C: No, no, no! I consulted with Dave Robertson and Andy Simpson, from Rare Whisky 101, and they suggested I accompany them to an upcoming auction in Montrose. Jan gave me a budget, I told Dave and Andy what sort of things I was looking for and over the course of a weekend I managed to source a number of rather exciting bottles, some of which I hadn’t had the pleasure of tasting for several years. I supplemented my auction haul with a few bottles from my personal collection at home to round the selection off. T: I see there are a few distilleries which pop up twice in your selection, a couple of Cardhus from the 1970s and 1980s, and a couple of Glengoynes from the same decades. Why is that? C: Before I discuss that, you really must try the old Cardhu! C: Ah, that’s better! So, I really want patrons who visit the Kaleidoscope Bar to explore the progression of flavour. By that, I mean doing something of a small ‘vertical’ tasting of a distillery, you know, tasting Cardhu 12yo from the 1970s, then the 1980s and comparing that to its modern day counterpart. T : How do you feel whiskies, in general, have changed over the decades? C: You look back at whisky from the 1950s and a lot of it was a bit smokier back then. Coal and peat were being used around the distillery more, direct firing will also have had an effect on the spirit and even moving forward, a lot of whiskies had a more waxy, oily character to them than they do now. The most obvious example nowadays is Clynelish, but previously, when distilleries weren’t cleaned quite so thoroughly or quite so often, the build up of various ‘organic components’, shall we say, will have contributed to this character. T: Therefore, do you think whisky, generally speaking, has improved or declined over the years? C: That’s an interesting one, but here’s a story for you. I’m part of a little whisky club which meets every quarter or so and we each bring a couple of bottles of whisky; a ‘now’ bottle and a ‘then’ bottle. You know, a bottle of 12yo from such and such a distillery which was released in the 1970s, and a modern day 12yo from the same distillery. We taste the whisky in pairs, blind, and almost without exception the ‘then’ whisky is preferable. 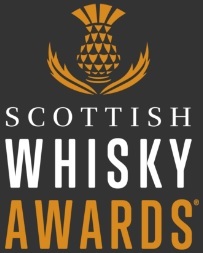 T: What can we expect to see in terms of future bottles in your guest selection here at SMWS? C: The empties are always being topped up and replaced with something else, but really you should ask Jan to get back in touch with me and give me a bigger budget! T: Any particular favourites here at the moment? C: Oh, well, let me see… that bottle of Balvenie Founder’s Reserve (the one in the old cognac-shaped bottle) is absolutely terrific. T: Finally, can you describe your collection in three words? C: Unusual, interesting, and fun! T: Much like this interview I’d say! Many thanks for your time once again this afternoon, Charlie, and safe travels! This entry was posted	on Tuesday, December 6th, 2016 at 3:10 pm	and is filed under Featured, News, Whisky Bars. You can follow any responses to this entry through the RSS 2.0 feed. Responses are currently closed, but you can trackback from your own site.